August 28, 2018 at 8:49 pm. NORMAN, Okla. — Florida Atlantic coach Lane Kiffin won’t say who his quarterback will be Saturday when the Owls open the season at No. 7 Oklahoma. But Kiffin had plenty to say about Sooners starting quarterback Kyler Murray, who earned the full-time starter role after beating out Austin Kendall in the preseason. Murray started three games as a true freshman at Texas A&M in 2015 before transferring, then served as Baker Mayfield’s backup a year ago — even starting one game when Mayfield was suspended for the opening drive against West Virginia. Murray’s speed is what keeps Kiffin up at night. “These are the guys you want to play the least,” Kiffin said. “I have always thought they give you the most problems. The guys that when plays don’t happen in rhythm — like a lot of plays in football, especially college — they have the ability to get out of trouble. A year ago, Oklahoma entered the season with no questions at quarterback with Mayfield, the eventual Heisman Trophy winner, but with plenty at running back and wide receiver. 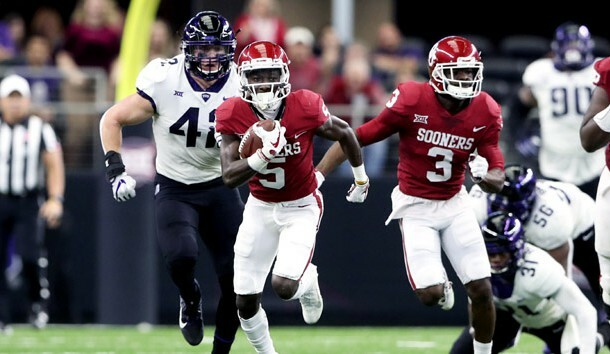 This season, the Sooners have plenty of firepower returning at running back and wide receiver but a question mark at quarterback after Mayfield’s departure. Murray struggled with interceptions during his freshman year but Sooners coach Lincoln Riley said he expected a big leap this season, especially when it comes to throwing. Florida Atlantic will be breaking in a new quarterback as well. Kiffin will choose between a pair of players who started their careers at Power Five programs. Chris Robison signed with Oklahoma out of high school before being dismissed shortly after his arrival in Norman. DeAndre Johnson began at Florida State before being dismissed in 2015 after an incident at a Tallahassee bar where he punched a woman. Robison transferred immediately to FAU, while Johnson went to East Mississippi Community College before finding his way to Kiffin’s squad. Riley recruited Robison, and said he is rooting for the quarterback’s success after the season opener. Like the Sooners and Rodney Anderson, Florida Atlantic has a proven running back in junior Devin Singletary. Singletary rushed for 1,920 yards and 32 touchdowns a year ago. Oklahoma middle linebacker Kenneth Murray said he’s been impressed with what he’s seen from Singletary. Kenneth Murray figures to be a key if Oklahoma’s defense is to improve this season. The Sooners had the best offense in college football a year ago with Mayfield in charge, but in the Rose Bowl against Georgia in last season’s College Football Playoff, the defense struggled to contain the Bulldogs, especially on the ground. While Riley announced his starting quarterback, the Sooners have other spots that are open heading into the final week — primarily on defense. Caleb Kelly, who has started 19 games at linebacker over the past two seasons, is fighting with redshirt senior Curtis Bolton to be the starter at the weakside spot. The other area of focus for Oklahoma’s defense heading into the last few days before the opener are the safety spots, where Kahlil Haughton and Jordan Parker are battling to start at free safety. Redshirt freshman Justin Broiles and sophomore Robert Barnes are battling to start at strong safety after Barnes was in and out of the starting lineup a year ago.